In the ever-evolving landscape of virtual reality (VR) technology, a number of key hurdles remain. But a team of computer scientists have tackled one of the major challenges in VR that will greatly improve user experience—enabling an immersive virtual experience while being physically limited to one's actual, real-world space. The research team will present their work at SIGGRAPH 2018. Computer scientists from Stony Brook University, NVIDIA and Adobe have collaborated on a computational framework that gives VR users the perception of infinite walking in the virtual world—while limited to a small physical space. The framework also enables this free-walking experience for users without causing dizziness, shakiness, or discomfort typically tied to physical movement in VR. And, users avoid bumping into objects in the physical space while in the VR world. To do this, the researchers focused on manipulating a user's walking direction by working with a basic natural phenomenon of the human eye, called saccade. Saccades are quick eye movements that occur when we look at a different point in our field of vision, like when scanning a room or viewing a painting. Saccades occur without our control and generally several times per second. During that time, our brains largely ignore visual input in a phenomenon known as "saccadic suppression"—leaving us completely oblivious to our temporary blindness, and the motion that our eyes performed. "In VR, we can display vast universes; however, the physical spaces in our homes and offices are much smaller," says lead author of the work, Qi Sun, a Ph.D. student at Stony Brook University and former research intern at Adobe Research and NVIDIA. "It's the nature of the human eye to scan a scene by moving rapidly between points of fixation. We realized that if we rotate the virtual camera just slightly during saccades, we can redirect a user's walking direction to simulate a larger walking space." 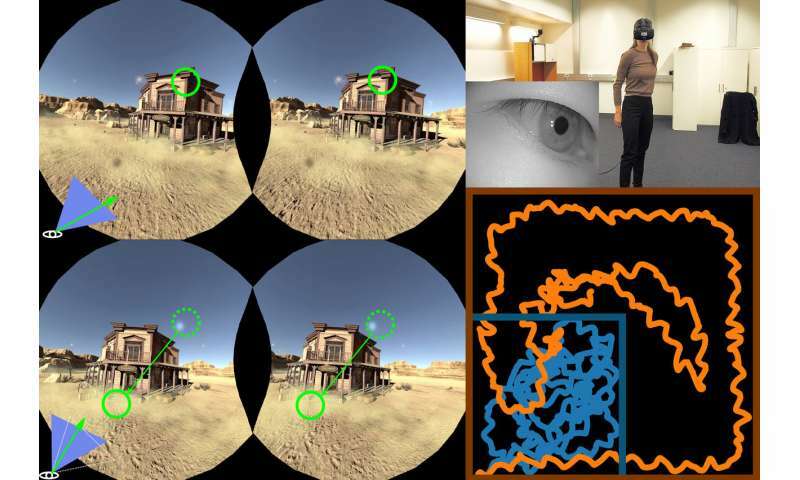 Using a head- and eye-tracking VR headset, the researchers' new method detects saccadic suppression and redirects users during the resulting temporary blindness. When more redirection is required, researchers attempt to encourage saccades using a tailored version of subtle gaze direction—a method that can dynamically encourage saccades by creating points of contrast in our visual periphery. "Currently in VR, it is still difficult to deliver a completely natural walking experience to VR users," says Sun. "That is the primary motivation behind our work—to eliminate this constraint and enable fully immersive experiences in large virtual worlds."